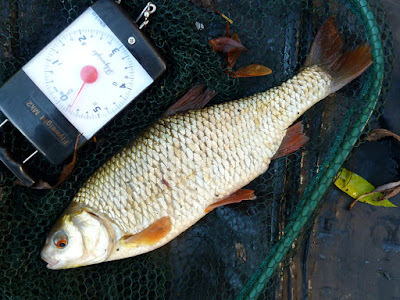 Last Saturday morning James and I headed out for some floodwater trotting, I ended up with a dozen roach to just under a pound (and a surprise barbel). What struck me was the roach were up in the water, the bottom was gudgeon territory. This morning it was an early start, a couple of trains and an exercise in patience - I hadn't brought a torch and although I could set everything else up I couldn't tie the size 18 until I had enough daylight! 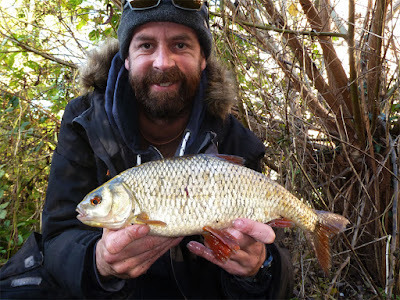 Three hours of trotting later, 2 trout and 2 minnows were on the books but I was running out of time - then the bite I was waiting for, a roach and it looked like the two I was after (I saw it as she lodged herself under a weedbed). Gently pulled through the weeds, a couple of lunges and she was safely resting in the net while I set up the camera and zeroed the scales. A very different shape to last weeks, this one was longer, thick but lacked depth - last weeks was fresh off the mint, this one was an old bruiser. The scales rested just shy of the magic number, I had to settle for 1lb 15oz, but a beautiful bronze fish I really couldn't complain - Getting closer!